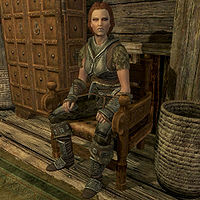 Iona is a Nord warrior who is assigned to you as a housecarl when you become a thane of the Rift. She does not exist until this happens and she is available to follow you as soon as she does. Her default equipment is steel cuffed boots, steel armor, and steel Nordic gauntlets. She carries a steel shield and a steel war axe. She is a potential marriage partner and Blades recruit. Although supposedly protected like most followers, it seems that Iona can die in regular combat, without being hit by the player. This page was last modified on 10 April 2019, at 11:46.